Born and raised in Salina, KS, I graduated from Salina Central High in 2001. 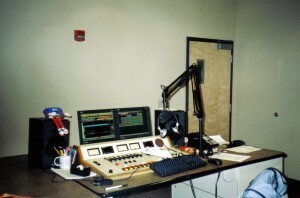 It was in 2001 that I got my first job in broadcasting: after spending time as an intern, I got hired on to be a part of the morning radio show for KILS 92.7, The Zoo in Salina. What a blast! I had so much fun being a part of that show. After a few months I was asked to become more involved, reading morning sports and news. However, I knew I needed to go to college and get an education. I then took a 900 mile journey to North Dakota. Yeah, North Dakota. Why, you ask? Long story short: there was a Broadcasting program there, and tuition was cheap (even being an out-of-state student). 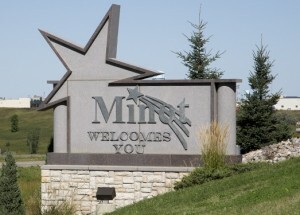 Within days of being in the Great White North, I was hired to work for Clear Channel radio in Minot, ND. I started as the overnight/weekend DJ for KZPR 105.3 The Fox and 910 AM KCJB. Now, for those wondering, my radio name of JD Black had already been given to me by this point from my Salina radio days (thanks JJ and Brother Ken!). Within a few months I had worked my way up to “general fill-in guy”. Doesn’t sound that great, but it was a huge opportunity for me. Basically anytime someone was ill or on vacation, I got to fill their shift on any one of the six stations Clear Channel owned in town. I got a taste of EVERY radio format! 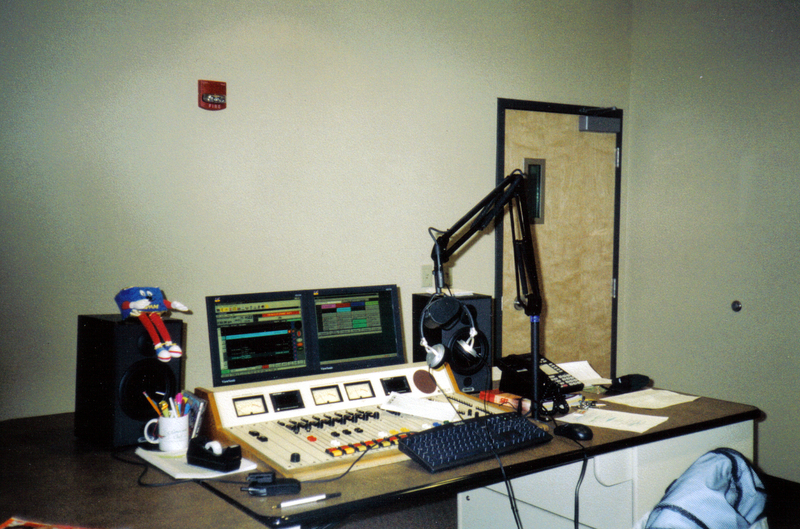 By Spring of 2002, I landed the afternoon drive shift (2-7p) on KIZZ-FM, Z-94, the top 40 station. It was a perfect fit for me. We had a lot of fun playing various games and contests on the air and I greatly enjoyed getting paid to have a good time at “work”. Two years later I was promoted to Music Director of KIZZ-FM. Here I was at 21-years-old and I was finishing college at Minot State, winning radio awards, and programming Minot’s #1 Hit Music Station. I could hardly believe this was happening to me! Perhaps one of the best honors of my radio career was given to me in September of 2004 when I was awarded “Best Radio Show in the State”, topping DJs from Bismarck and Fargo that had been doing radio for years. I was stunned. Everything was going well for me, so well, in fact, that I got a call from a former radio friend that wanted me to do some voice work back in Salina. For a few months not only was I on the air in North Dakota, but I was also being heard on The Buzz, 104.9 in Salina, KS! How cool was that?! However, it wouldn’t last long. The radio business was in a tailspin and soon things would greatly change for me. The Buzz was sold to new owners and my services were no longer needed. At the same time, issues arose in Minot leading to me and Clear Channel parting ways. After four years in the radio business I found myself wondering “what now?”. Luck was on my side. A few days after leaving radio, I got a call from KXMC, the CBS TV station in Minot. They were looking to find a weekend weather guy. Now TV wasn’t ever a field I thought I would be a part of, but here was my chance to be a weatherman…something I had always wanted to be. Plus, I didn’t think I had the right “look” for TV. I was a plump 255lbs; not ideal TV weight. However, in December of 2004, I began my career in television. 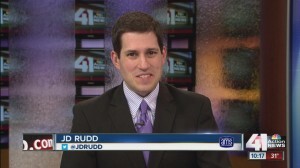 I made my on air debut a couple weeks later; see my first weather cast by clicking this link. By the summer of ‘05 I also started doing news reporting for the station as well. I could not believe how much fun TV was. And soon enough, I began winning awards for my TV work. May of 2005 marked my final semester at Minot State. I walked across the stage with a B.A. in Broadcasting that spring. During that semester of school I also revamped the broadcasting department’s weather capabilities. Adding a green screen, graphics and more. I stayed on as an assistant of sorts to the college, helping with such events as the annual KMSU auction and serving as play-by-play guy for live broadcasts of the college basketball games. More changes came my way toward the end of 2006. I was contacted about taking a job “across the street” for the NBC station. They wanted me to be their main weather anchor. 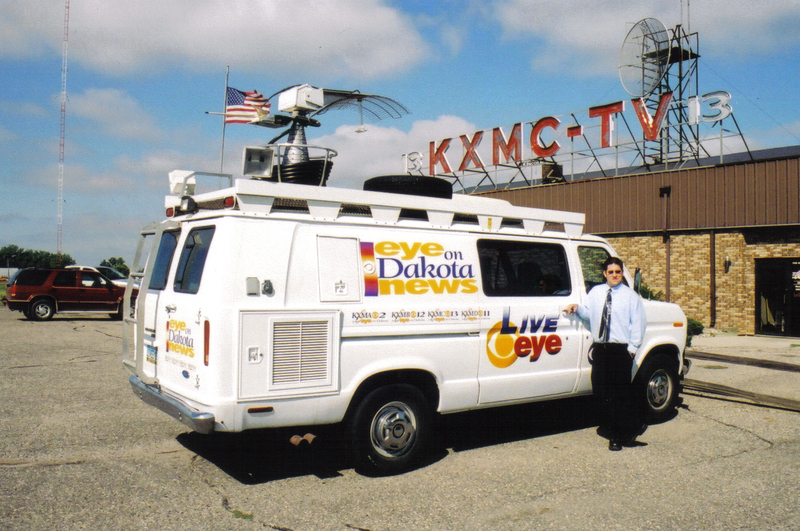 On January 7th, 2007 I made my debut as the Weather Director of KMOT-TV. Thanks to some sponsorships, we managed to add several “toys” to the weather department, including an outdoor Weather Deck. Now I was able to deliver the forecast 5 nights a week; with some of those weathercasts putting me right outside in the elements. 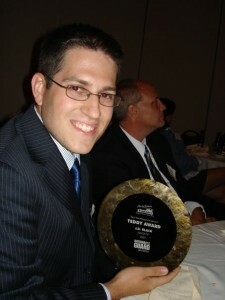 In 2007, I was honored to be named the “Weatherperson of the Year” by the North Dakota Broadcasters Association. Truly a highlight of my young career. KMOT taught me so much about TV and about weather. In addition to work, I had also been taking classes from Mississippi State University so that I could get my Certificate in Meteorology. Might as well capitalize on things, right?! It was also during this time I really tried my best to slim down and drop some of the weight I’d been carting around for years. Thanks to some proper dieting and exercise, I managed to lose about 40 pounds between the end of 2006 and the end of 2007. As it seems, more changes were about to impact me heading toward 2008. I was informed that one of the TV stations I grew up watching in Wichita, KS had an opening for a meteorologist. I didn’t think I had much of a chance, but sent a copy of my work to them and waited for a response. To my surprise, they wanted to hire me. January 5th, 2008 was my final newscast on KMOT, as I then packed up my things and moved to Wichita. I began working on-air at KSNW on Jan. 8th, just three days later. I finished my Certificate from Mississippi State in the summer of 2008 and shortly after applied for an AMS seal of approval. Six months later, I was awarded the seal and crossed another major milestone in my broadcasting career. I continued to try and lose more weight during my time at KSN, managing to drop about another 30 pounds over the course of a couple years. It feels great to not walk in front of the camera and see a huge blob of ‘me’ anymore! As you may have guessed, I managed to work my way up the KSN ladder over time. I was promoted up to weekend evening meteorologist in March of 2009. By the summer of 2011, I was promoted once again. This time I took over the 10p weeknight meteorologist spot. Yep, I was back on-air giving the forecast five nights a week. 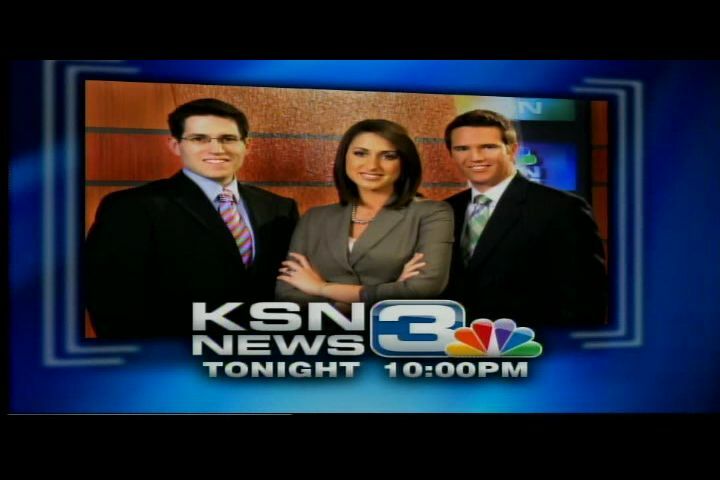 In January of 2012, KSN began producing the 9p newscast for KSAS (FOX Kansas) in Wichita. I was asked to serve as the weeknight 9p Meteorologist for them. This put me on air every weeknight at 9p & 10p giving weather forecasts. In the Fall of 2013, it was time for a change. KSHB-TV in Kansas City came calling and asked if I’d like to be their new weekend evening Meteorologist. Given a few things taking place behind the scenes in Wichita, I jumped at the chance. While it’s never easy to leave behind friends (both on air and off), this was an opportunity too good to pass up. By October of 2013 I was on the air in KC. Amazing! Three years later and my what has changed! In the Summer, I asked the woman of my dreams to marry me (she said yes). I was able to pull of a private proposal at Kauffman Stadium while the team was on the road. Many thanks to Toby & the crew for all of their help! The Royals have been a keystone in our relationship, so it was only fitting I have them involved somehow! In September, Alyson and I tied the knot in a beautiful ceremony in her homestate of Illinois. Truly I say to you: I am blessed! My creative work blending weather forecasting and graphics (with a dash of humor) paid off in October of 2016. I was honored to receive an EMMY for my work as a TV weather talent. It was the first EMMY I was ever nominated for, so truly humbling and rewarding. Also in the fall of 2016 I made a move within the EW Scripps company. I was promoted to weekday morning meteorologist for Cleveland station WEWS-TV (News 5). It’s a much larger TV market and put me back on weekdays for the first time since Wichita. While getting up at 12:30am wasn’t easy (yes, that’s actually when my alarm would go off each morning), I truly enjoyed getting to have some fun and help people start their day. Spectrum News launched a brand new, 24-7 cable news channel in Ohio *and* in Wisconsin in November of 2018. I was lucky enough to catch a break and join the Wisconsin team, becoming the Chief Meteorologist for Spectrum News 1 Wisconsin. This move puts my wife and I (almost literally) in her parent’s backyard. Tons of her family live near the Illinois/Wisconsin line, so this opening could not have been better. Plus, I’m back to working evenings/nights, which is something I don’t mind at all! I have no idea where this crazy road is going to take me. But I will continue to follow it. And who knows where I may end up next…and when. Keep your eyes peeled! If you’re every in the Rock N Roll city, look for me! A SPECIAL thanks to those who have helped me along the way: Norwood, you’ve been a great friend for many years. You’ve helped me move halfway across the country twice and been there during the tough times. I can’t thank you enough! Here’s to you, buddy! Neil, Mike B, JJ: you guys taught me more than you can ever realize about broadcasting. Believe me, I have learned so much from each of you. To my KX & KMOT families: thank you guys for being there and being awesome as I broke into the TV business. We had some fun, didn’t we?! To this day, still some of the best moments of my career. I will never forget where I came from, and the lessons I learned while first starting out.